Very often, after the use of solid soap remain unattractive and seemingly unnecessary "remnants". However, with a little imagination, of which you can cook a new scented soap. It is ideal for home use and will be a wonderful gift to friends for the holidays. To prepare liquid soap remnants, floral waters and essential oils. Grate the bars of soap on a coarse grater or chop with a knife, pour them into a small saucepan and add water. Leave to infuse for half an hour, and then place the container on a water bath. When the soap is well dissolved, remove the pan from the fire and wait until it cools off. Add a teaspoon of glycerin or vodka. Using a pipette, drip a few drops of essential oils and floral water, mix thoroughly. To the cooked soap was antibacterial, can add essential oil of tea tree. Pour soap in a clean, airtight bottle with a pump dispenser, which will prevent evaporation and drying. If the soap is still a little lumpy, again warm it in a water bath and stir until a homogeneous creamy mass. For preparing solid soap, using a coarse grater, chop the remnants. Pour them into a small plastic bowl and pour hot water. Cover with a lid and microwave on high for 15 seconds. Then remove, stir well and put in the oven. We perform this procedure until, until soap is completely melted. Be careful it does not boil. 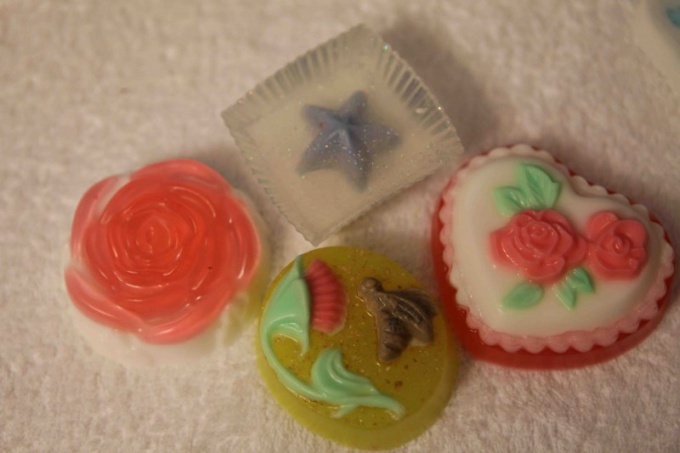 Lubricate the prepared soap molds with oil and pour into them the mixture. Very suitable for this silicone mold for baking cupcakes, cans or baby molds for sand. Leave the soap on for a few days, that it had properly dried. If you want you can add in melted soap flower petals, ground coffee or oatmeal. And so they did not drop to the bottom after pouring into molds, after 2 - 3 minutes, when the mass has cooled slightly, whisk it. If you want to make soap, lay in the remnants of different size, without mixing the colors.